Jolly Saint Nick comes to Caramoor to fill the Rosen House with holiday cheer. 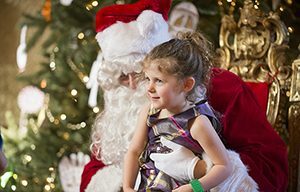 The little ones will be in for an adventure with I Spy a Santa or Two in the Music Room followed by a 30-minute concert of favorite holiday songs, then Santa Claus appears to delight the whole family. Santa’s favorite snack — milk and cookies — will be served in the Summer Dining Room. Bring your cameras and begin the festive season with joy!